Charlotte told Vogue… Being young, I felt the need to express a point of difference within my field – to draw people in, to show them that I have what it takes and MORE to be their hairdresser. In May last year I realized my dreams when I opened ‘LE SALON – Melbourne, Australia – Chamonix, France’ in Bayside Sandringham, my home town. Being a good hairdresser is not just learning your trade and practicing the same thing each day, it is about growing and learning every single day at every chance you get. It is about encouraging your clients to grow as well, not letting them slip into a boring haircut. You need to look at each client with fresh eyes each time they walk though your salon doors. You need to be both observant and creative, whilst being efficient and accommodating too. As for the pampering side, I have designed my Salon so that my clients can feel as though they are in their own lounge room, whilst being treated to refreshments and the latest magazines, served to them at their leisure. They can visit the Beauty Room for make up, facials, pedicures and waxing. Having had their hair washed while seated in our vibrating massage chairs, then cut/coloured/blow waved, my clients should walk out feeling beautiful, relaxed and as light as a feather. We were then asked back again for the New Year edition January 2012. 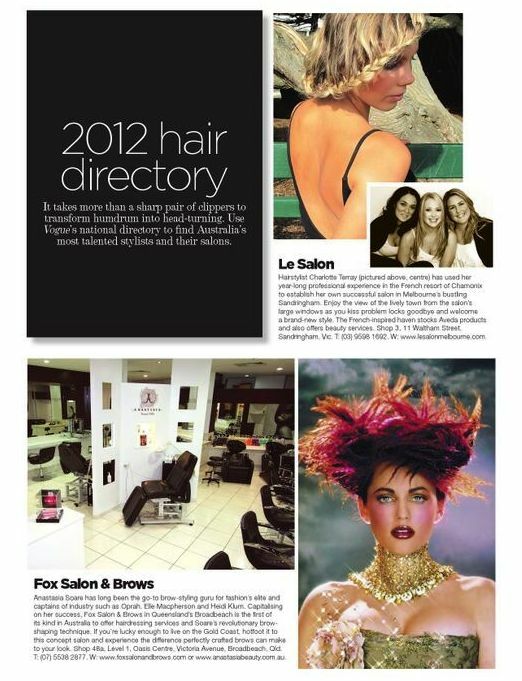 We are really proud of our Le Salon editorials. TYjnxu I went over this web site and I believe you have a lot of great information, saved to fav (:. I just want to say I am just very new to blogging and honestly liked this page. More than likely I’m planning to bookmark your site . You surely have beneficial posts. With thanks for sharing with us your blog. Generally I don’t read article on blogs, but I would like to say that this write-up very forced me to take a look at and do it! Your writing taste has been surprised me. Thank you, very great post. I have to point out my respect for your kindness supporting those who absolutely need assistance with this important theme. Your real dedication to getting the message all-around appears to be rather invaluable and have made those much like me to arrive at their aims. Your informative suggestions signifies this much to me and extremely more to my peers. Thanks a lot; from all of us. Thanks a lot for providing individuals with such a spectacular possiblity to check tips from this website. It really is very awesome and as well , packed with amusement for me personally and my office co-workers to visit your blog more than 3 times in a week to learn the newest items you have got. And definitely, I am always impressed with all the excellent methods you serve. Some 1 areas in this posting are rather the best I’ve ever had. hello!,I really like your writing so much! proportion we keep up a correspondence extra about your article on AOL? I need a specialist on this space to resolve my problem. May be that’s you! Taking a look forward to look you. Thank you for any other fantastic post. The place else may anybody get that kind of information in such an ideal means of writing? I’ve a presentation next week, and I am on the look for such information. Fantastic site. A lot of helpful information here. I¡¦m sending it to some buddies ans also sharing in delicious. And of course, thanks on your effort! I have read a few just right stuff here. Definitely price bookmarking for revisiting. I surprise how much effort you put to make any such excellent informative site. Hello, You have done a great job. I will obviously digg it and actually endorse to my buddies. I am certain they will be benefited from this great site. Hello, Neat post. There is a problem together with your site in web explorer, might test this¡K IE still is the market leader and a big part of folks will omit your magnificent writing due to this problem. Thank you for any other great post. The place else could anybody get that type of info in such an ideal way of writing? I’ve a presentation subsequent week, and I’m on the look for such info. I have been exploring for a little bit for any high-quality articles or weblog posts in this sort of space . Exploring in Yahoo I eventually stumbled upon this web site. Reading this information So i¡¦m satisfied to express that I’ve an incredibly just right uncanny feeling I found out exactly what I needed. I most undoubtedly will make certain to don¡¦t forget this site and give it a glance on a constant basis. Watch Anime Online Free English Dubbed Anxiety is an issue that many people have to deal with today. Often times unnecessary worry which leads to a lot of stress is what causes you to feel anxious. You need to change the way you think in order to help avoid issues. The following article contains a number of helpful tips to get you to think more positively. Hi my family member! I wish to say that this post is amazing, nice written and include almost all vital infos. I’d like to peer more posts like this. Simply wanna comment on few general things, The website style is perfect, the content material is really great. “War is much too serious a matter to be entrusted to the military.” by Georges Clemenceau. I precisely wanted to say thanks once again. I do not know the things I could possibly have carried out in the absence of the smart ideas documented by you on such a topic. This was an absolute terrifying case for me, however , taking a look at a specialised fashion you solved that made me to cry over contentment. I will be happier for the advice and then hope you realize what an amazing job that you are undertaking training people today by way of your blog. Most probably you have never encountered any of us. Good ¡V I should definitely pronounce, impressed with your website. I had no trouble navigating through all tabs as well as related info ended up being truly simple to do to access. I recently found what I hoped for before you know it in the least. Quite unusual. Is likely to appreciate it for those who add forums or something, site theme . a tones way for your customer to communicate. Excellent task..
I¡¦ve been exploring for a little for any high-quality articles or blog posts in this sort of house . Exploring in Yahoo I eventually stumbled upon this web site. Studying this information So i am happy to convey that I have a very excellent uncanny feeling I came upon just what I needed. I most undoubtedly will make sure to don¡¦t put out of your mind this website and give it a glance regularly. It’s truly a nice and helpful piece of info. I am glad that you simply shared this useful information with us. Please stay us informed like this. Thank you for sharing. Its wonderful as your other content : D, appreciate it for putting up. “Always be nice to people on the way up because you’ll meet the same people on the way down.” by Wilson Mizner. I was reading some of your articles on this website and I think this website is rattling informative! Retain putting up. of course like your web site but you need to test the spelling on quite a few of your posts. Several of them are rife with spelling issues and I find it very troublesome to tell the reality nevertheless I will certainly come again again. I was studying some of your blog posts on this site and I believe this site is really instructive! Keep posting. Some truly nice and utilitarian information on this site, likewise I believe the style contains great features. What i don’t realize is if truth be told how you are not really a lot more smartly-favored than you may be now. You are so intelligent. You realize therefore significantly in relation to this topic, made me for my part believe it from so many varied angles. Its like men and women aren’t fascinated unless it is one thing to accomplish with Lady gaga! Your individual stuffs nice. At all times deal with it up! I am uncertain of where you are supposedly getting your information, however great topic. I must take some time studying even more or understanding far more. Thank you for excellent information I had been seeking this content in my goal. It’s actually a nice and useful piece of info. I’m glad that you just shared this helpful info with us. Please keep us informed like this. Thanks for sharing. Simply wish to say your article is as astounding. The clearness in your post is just excellent and i can assume you’re an expert on this subject. Well with your permission let me to grab your RSS feed to keep updated with forthcoming post. Thanks a million and please carry on the gratifying work. I needed to compose you a tiny note to help give thanks yet again on the lovely pointers you have provided on this website. This is really pretty generous with you to give unreservedly all many people would’ve made available as an e book to earn some cash on their own, precisely considering the fact that you might well have done it if you ever decided. Those basics also served to be the easy way to fully grasp someone else have a similar interest the same as my personal own to grasp a good deal more regarding this condition. I think there are many more enjoyable situations ahead for people who go through your blog post. Some truly wonderful articles on this site, thank you for contribution. “A conservative is a man who sits and thinks, mostly sits.” by Woodrow Wilson. fantastic issues altogether, you just won a brand new reader. What might you suggest in regards to your post that you simply made some days ago? Any certain? Really wonderful information can be found on website . “You have to learn that if you start making sure you feel good, everything will be okay.” by Ruben Studdard. I do agree with all of the ideas you have presented to your post. They’re very convincing and will certainly work. Nonetheless, the posts are too quick for newbies. May just you please prolong them a little from subsequent time? Thank you for the post. Some genuinely nice and utilitarian information on this website, as well I believe the design has got excellent features. Hello there. I discovered your site by the use of Google even as looking for a related topic, your web site got here up. It appears great. I’ve bookmarked it in my google bookmarks to come back then. Hey there. I found your blog by the use of Google whilst searching for a comparable topic, your website came up. It seems to be great. I have bookmarked it in my google bookmarks to come back then. Hiya, I am really glad I’ve found this info. Nowadays bloggers publish just about gossip and web stuff and this is actually irritating. A good blog with interesting content, that is what I need. Thank you for making this web site, and I’ll be visiting again. Do you do newsletters by email? Hello there. I found your website by means of Google whilst looking for a comparable subject, your site came up. It appears great. I have bookmarked it in my google bookmarks to visit then. Hi there. I found your site by way of Google while looking for a related topic, your website got here up. It seems to be good. I’ve bookmarked it in my google bookmarks to visit then. Hiya, I am really glad I have found this info. Nowadays bloggers publish just about gossip and web stuff and this is actually frustrating. A good web site with exciting content, this is what I need. Thanks for making this web site, and I’ll be visiting again. Do you do newsletters by email? Hiya, I am really glad I have found this info. Nowadays bloggers publish just about gossip and web stuff and this is really annoying. A good web site with interesting content, this is what I need. Thanks for making this website, and I will be visiting again. Do you do newsletters by email? Hiya, I’m really glad I have found this information. Nowadays bloggers publish only about gossip and internet stuff and this is really annoying. A good site with interesting content, this is what I need. Thanks for making this site, and I’ll be visiting again. Do you do newsletters by email? Hello there. I found your web site by means of Google even as looking for a similar subject, your site came up. It seems good. I have bookmarked it in my google bookmarks to visit then. Hello there. I discovered your website by the use of Google whilst looking for a similar subject, your web site came up. It seems to be great. I have bookmarked it in my google bookmarks to visit then. Hello there. I discovered your site by means of Google whilst searching for a similar matter, your web site got here up. It appears good. I have bookmarked it in my google bookmarks to visit then. obviously like your web site however you need to check the spelling on quite a few of your posts. Many of them are rife with spelling issues and I to find it very troublesome to inform the truth then again I’ll definitely come back again. Hiya, I am really glad I have found this information. Today bloggers publish only about gossip and internet stuff and this is actually frustrating. A good site with exciting content, that’s what I need. Thank you for making this site, and I will be visiting again. Do you do newsletters by email? Hiya, I’m really glad I have found this info. Today bloggers publish just about gossip and net stuff and this is really frustrating. A good website with exciting content, that is what I need. Thanks for making this web site, and I’ll be visiting again. Do you do newsletters by email? Thanks for sharing excellent informations. Your website is so cool. I am impressed by the details that you have on this website. It reveals how nicely you understand this subject. Bookmarked this web page, will come back for extra articles. You, my pal, ROCK! I found just the information I already searched everywhere and just couldn’t come across. What a perfect site. Hey there. I discovered your site by way of Google at the same time as looking for a similar subject, your web site got here up. It appears to be great. I have bookmarked it in my google bookmarks to visit then. Hey there. I discovered your blog by means of Google even as looking for a related matter, your site came up. It looks great. I have bookmarked it in my google bookmarks to visit then. Hey there. I found your website by means of Google while searching for a similar topic, your website came up. It looks good. I’ve bookmarked it in my google bookmarks to come back then. Hi there. I found your blog via Google at the same time as looking for a similar matter, your website came up. It seems to be good. I’ve bookmarked it in my google bookmarks to visit then. Hiya, I’m really glad I’ve found this info. Nowadays bloggers publish just about gossip and net stuff and this is really frustrating. A good web site with interesting content, that is what I need. Thank you for making this website, and I will be visiting again. Do you do newsletters by email? Hi there. I discovered your blog by means of Google while looking for a similar matter, your web site got here up. It looks good. I’ve bookmarked it in my google bookmarks to visit then. Hi there. I found your website via Google whilst searching for a similar topic, your web site got here up. It appears great. I’ve bookmarked it in my google bookmarks to come back then. Hiya, I’m really glad I’ve found this info. Nowadays bloggers publish just about gossip and net stuff and this is really frustrating. A good web site with interesting content, that’s what I need. Thank you for making this site, and I will be visiting again. Do you do newsletters by email? Hello there. I found your web site by means of Google at the same time as looking for a similar topic, your site got here up. It seems to be good. I’ve bookmarked it in my google bookmarks to come back then. Hey there. I discovered your site via Google at the same time as searching for a related topic, your site got here up. It looks good. I’ve bookmarked it in my google bookmarks to visit then. Hey there. I discovered your web site by the use of Google even as searching for a comparable topic, your site came up. It seems good. I’ve bookmarked it in my google bookmarks to visit then. Hello there. I found your web site by means of Google at the same time as searching for a similar matter, your website came up. It looks good. I have bookmarked it in my google bookmarks to come back then. Hi there. I discovered your website via Google whilst searching for a similar topic, your web site came up. It appears good. I’ve bookmarked it in my google bookmarks to visit then. I just found out your web a couple of days back and I happen to be looking at it all frequently. you have great vary of beneficial information on the placement and that i moreover adore the actual variety of the venue at the same time. carry on the great work! Hi there. I discovered your blog via Google at the same time as looking for a related topic, your web site got here up. It appears great. I have bookmarked it in my google bookmarks to visit then. Hiya, I am really glad I have found this info. Nowadays bloggers publish just about gossip and net stuff and this is actually irritating. A good blog with interesting content, this is what I need. Thanks for making this site, and I’ll be visiting again. Do you do newsletters by email? Hiya, I am really glad I have found this information. Today bloggers publish just about gossip and net stuff and this is really irritating. A good web site with exciting content, this is what I need. Thank you for making this web-site, and I will be visiting again. Do you do newsletters by email? Hiya, I am really glad I have found this info. Nowadays bloggers publish only about gossip and net stuff and this is actually annoying. A good site with exciting content, this is what I need. Thank you for making this web-site, and I will be visiting again. Do you do newsletters by email? Thanks so much for providing individuals with an extraordinarily nice chance to discover important secrets from this blog. It can be so brilliant and as well , packed with a good time for me and my office mates to search your website particularly three times a week to read through the fresh issues you have. And of course, I’m so certainly pleased considering the mind-boggling creative ideas you give. Some 4 points in this posting are really the simplest I have had. Hey there. I discovered your site by way of Google at the same time as searching for a similar matter, your web site got here up. It looks great. I’ve bookmarked it in my google bookmarks to come back then. Hello there. I found your blog via Google at the same time as searching for a comparable matter, your web site came up. It seems good. I’ve bookmarked it in my google bookmarks to visit then. Hello there. I discovered your blog by means of Google whilst looking for a similar topic, your site came up. It seems good. I’ve bookmarked it in my google bookmarks to visit then. Hey there. I discovered your website via Google even as searching for a similar topic, your website came up. It seems to be great. I’ve bookmarked it in my google bookmarks to come back then. Hi there. I found your site via Google at the same time as looking for a similar subject, your site got here up. It seems good. I have bookmarked it in my google bookmarks to visit then. I’ll immediately clutch your rss as I can not to find your e-mail subscription link or newsletter service. Do you’ve any? Kindly permit me recognise so that I may just subscribe. Thanks. Hiya, I am really glad I have found this information. Nowadays bloggers publish just about gossip and web stuff and this is really irritating. A good web site with interesting content, this is what I need. Thanks for making this web site, and I’ll be visiting again. Do you do newsletters by email? Hi there. I discovered your web site by way of Google whilst searching for a comparable subject, your website got here up. It appears good. I have bookmarked it in my google bookmarks to come back then. Thanks for your personal marvelous posting! I quite enjoyed reading it, you could be a great author.I will make sure to bookmark your blog and will often come back someday. I want to encourage that you continue your great posts, have a nice morning! Hiya, I am really glad I have found this information. Nowadays bloggers publish just about gossip and internet stuff and this is actually irritating. A good web site with interesting content, that’s what I need. Thank you for making this site, and I will be visiting again. Do you do newsletters by email? Someone necessarily lend a hand to make critically posts I’d state. This is the very first time I frequented your web page and to this point? I surprised with the research you made to create this actual submit extraordinary. Excellent task! Hiya, I’m really glad I have found this information. Today bloggers publish just about gossip and web stuff and this is actually frustrating. A good blog with exciting content, that’s what I need. Thanks for making this website, and I will be visiting again. Do you do newsletters by email? Hello there! This is my 1st comment here so I just wanted to give a quick shout out and say I really enjoy reading your blog posts. Can you recommend any other blogs/websites/forums that go over the same subjects? Thanks for your time! I’m curious to find out what blog system you happen to be working with? I’m experiencing some minor security problems with my latest blog and I would like to find something more risk-free. Do you have any suggestions? Hi! I realize this is sort of off-topic but I needed to ask. Does managing a well-established website like yours take a massive amount work? I am completely new to blogging but I do write in my diary everyday. I’d like to start a blog so I can easily share my own experience and views online. Please let me know if you have any kind of suggestions or tips for brand new aspiring blog owners. Thankyou! Do you mind if I quote a few of your articles as long as I provide credit and sources back to your weblog? My website is in the very same niche as yours and my users would certainly benefit from some of the information you provide here. Please let me know if this ok with you. Thanks a lot! Hey there! I know this is kinda off topic however I’d figured I’d ask. Would you be interested in exchanging links or maybe guest authoring a blog article or vice-versa? My website discusses a lot of the same topics as yours and I think we could greatly benefit from each other. If you are interested feel free to shoot me an email. I look forward to hearing from you! Superb blog by the way! Hiya, I’m really glad I’ve found this info. Nowadays bloggers publish only about gossip and net stuff and this is actually irritating. A good blog with exciting content, that’s what I need. Thank you for making this web site, and I’ll be visiting again. Do you do newsletters by email? Hi there. I discovered your website by the use of Google whilst looking for a related subject, your web site got here up. It appears great. I’ve bookmarked it in my google bookmarks to visit then. Hello there. I discovered your site by means of Google while searching for a comparable subject, your website got here up. It appears good. I’ve bookmarked it in my google bookmarks to visit then. Hi there. I found your blog via Google even as searching for a similar subject, your site came up. It looks good. I have bookmarked it in my google bookmarks to come back then. Hiya, I’m really glad I’ve found this info. Today bloggers publish only about gossip and net stuff and this is really irritating. A good web site with interesting content, that’s what I need. Thank you for making this web site, and I will be visiting again. Do you do newsletters by email? Hiya, I’m really glad I have found this info. Today bloggers publish only about gossip and internet stuff and this is really annoying. A good site with exciting content, that is what I need. Thank you for making this website, and I’ll be visiting again. Do you do newsletters by email? Hello there. I found your website by way of Google at the same time as searching for a related matter, your website came up. It seems good. I have bookmarked it in my google bookmarks to come back then. Hiya, I’m really glad I’ve found this info. Today bloggers publish just about gossip and net stuff and this is actually irritating. A good site with exciting content, that’s what I need. Thank you for making this web site, and I will be visiting again. Do you do newsletters by email? Hiya, I’m really glad I have found this info. Today bloggers publish just about gossip and web stuff and this is really annoying. A good site with exciting content, that is what I need. Thanks for making this web site, and I will be visiting again. Do you do newsletters by email? Hi there. I found your blog via Google even as looking for a similar matter, your site got here up. It looks great. I’ve bookmarked it in my google bookmarks to come back then. Hiya, I’m really glad I’ve found this information. Nowadays bloggers publish only about gossip and internet stuff and this is actually frustrating. A good web site with interesting content, this is what I need. Thank you for making this website, and I’ll be visiting again. Do you do newsletters by email? Hi there. I discovered your site by way of Google even as looking for a similar topic, your site got here up. It appears to be great. I have bookmarked it in my google bookmarks to visit then. Hi there. I found your site via Google while searching for a similar topic, your site came up. It appears to be great. I’ve bookmarked it in my google bookmarks to visit then. I have been surfing on-line more than three hours these days, yet I never found any fascinating article like yours. It’s lovely worth sufficient for me. In my opinion, if all site owners and bloggers made just right content as you did, the internet will probably be a lot more helpful than ever before. “When you are content to be simply yourself and don’t compare or compete, everybody will respect you.” by Lao Tzu. Hiya, I am really glad I have found this info. Today bloggers publish only about gossip and net stuff and this is really frustrating. A good blog with exciting content, that is what I need. Thank you for making this site, and I’ll be visiting again. Do you do newsletters by email? Hey there. I found your site via Google even as looking for a similar topic, your web site came up. It seems to be great. I have bookmarked it in my google bookmarks to visit then. Hiya, I am really glad I have found this info. Today bloggers publish only about gossip and web stuff and this is really irritating. A good web site with exciting content, that is what I need. Thank you for making this web site, and I’ll be visiting again. Do you do newsletters by email? Hi there. I found your website by the use of Google even as searching for a similar topic, your web site got here up. It appears great. I’ve bookmarked it in my google bookmarks to visit then. Hi there! Someone in my Facebook group shared this site with us so I came to check it out. I’m definitely enjoying the information. I’m bookmarking and will be tweeting this to my followers! Outstanding blog and amazing style and design. Hiya, I’m really glad I’ve found this info. Nowadays bloggers publish just about gossip and web stuff and this is really annoying. A good website with exciting content, this is what I need. Thank you for making this website, and I will be visiting again. Do you do newsletters by email? Hiya, I’m really glad I’ve found this information. Nowadays bloggers publish only about gossip and internet stuff and this is actually annoying. A good blog with interesting content, that’s what I need. Thank you for making this web site, and I will be visiting again. Do you do newsletters by email? Hello there. I found your site by the use of Google whilst searching for a comparable subject, your web site came up. It looks good. I’ve bookmarked it in my google bookmarks to visit then. Hello there. I found your website by the use of Google at the same time as searching for a related matter, your website came up. It looks good. I have bookmarked it in my google bookmarks to visit then. Hiya, I’m really glad I have found this information. Nowadays bloggers publish just about gossip and net stuff and this is actually frustrating. A good site with exciting content, this is what I need. Thanks for making this web site, and I will be visiting again. Do you do newsletters by email? Hiya, I am really glad I have found this information. Nowadays bloggers publish only about gossip and web stuff and this is actually irritating. A good blog with exciting content, this is what I need. Thank you for making this website, and I’ll be visiting again. Do you do newsletters by email? Hello there. I discovered your web site by way of Google even as looking for a similar topic, your web site got here up. It looks great. I’ve bookmarked it in my google bookmarks to visit then. Hiya, I’m really glad I have found this info. Nowadays bloggers publish just about gossip and net stuff and this is actually irritating. A good site with exciting content, that’s what I need. Thank you for making this website, and I will be visiting again. Do you do newsletters by email? Hey there. I discovered your blog by way of Google whilst searching for a related matter, your website got here up. It seems to be good. I’ve bookmarked it in my google bookmarks to come back then. Keep up the fantastic piece of work, I read few content on this web site and I believe that your website is very interesting and holds circles of fantastic info . Hi there. I found your web site by the use of Google whilst looking for a related subject, your website came up. It appears to be great. I’ve bookmarked it in my google bookmarks to visit then. Hiya, I’m really glad I’ve found this info. Nowadays bloggers publish just about gossip and web stuff and this is really frustrating. A good website with exciting content, that is what I need. Thank you for making this web site, and I’ll be visiting again. Do you do newsletters by email? Hello there. I found your web site via Google while searching for a similar topic, your website got here up. It seems great. I’ve bookmarked it in my google bookmarks to visit then. Hey there. I discovered your website via Google while looking for a similar topic, your web site got here up. It appears great. I’ve bookmarked it in my google bookmarks to visit then. hi!,I love your writing very so much! share we keep in touch more approximately your post on AOL? I require a specialist in this space to resolve my problem. Maybe that is you! Looking ahead to look you. Whats Going down i am new to this, I stumbled upon this I’ve found It positively useful and it has helped me out loads. I am hoping to give a contribution & assist other customers like its aided me. Good job. Hiya, I’m really glad I have found this info. Today bloggers publish only about gossip and net stuff and this is actually frustrating. A good website with exciting content, that is what I need. Thanks for making this website, and I will be visiting again. Do you do newsletters by email? Hi there. I found your website by the use of Google while searching for a similar topic, your web site got here up. It seems to be good. I have bookmarked it in my google bookmarks to visit then. Hiya, I’m really glad I have found this info. Nowadays bloggers publish only about gossip and net stuff and this is really irritating. A good web site with exciting content, that’s what I need. Thank you for making this website, and I will be visiting again. Do you do newsletters by email? Hello there. I discovered your web site via Google at the same time as searching for a related matter, your website got here up. It appears to be great. I’ve bookmarked it in my google bookmarks to visit then. It is truly a great and helpful piece of information. I’m happy that you simply shared this helpful information with us. Please stay us informed like this. Thank you for sharing. My spouse and i were so peaceful when Albert could finish up his basic research while using the precious recommendations he made while using the web site. It is now and again perplexing to simply continually be giving for free helpful hints that many other folks could have been making money from. Therefore we see we have got the writer to appreciate because of that. The specific illustrations you’ve made, the straightforward site navigation, the friendships you give support to promote – it’s many wonderful, and it’s leading our son and the family understand the situation is pleasurable, and that’s highly vital. Many thanks for all! Thanks for sharing excellent informations. Your web-site is very cool. I am impressed by the details that you have on this web site. It reveals how nicely you perceive this subject. Bookmarked this website page, will come back for more articles. You, my pal, ROCK! I found just the information I already searched all over the place and simply couldn’t come across. What a perfect site. Hiya, I am really glad I’ve found this info. Today bloggers publish only about gossip and net stuff and this is really annoying. A good blog with exciting content, this is what I need. Thank you for making this website, and I will be visiting again. Do you do newsletters by email? Hello there. I discovered your website via Google while looking for a comparable topic, your web site got here up. It seems to be good. I have bookmarked it in my google bookmarks to come back then. It’s remarkable in support of me to have a website, which is valuable in support of my experience. Hey there. I discovered your site by the use of Google at the same time as searching for a comparable topic, your web site got here up. It seems to be great. I’ve bookmarked it in my google bookmarks to come back then. Hi there. I found your website by the use of Google at the same time as looking for a related subject, your site came up. It appears to be good. I have bookmarked it in my google bookmarks to come back then. Hello there. I found your website by means of Google at the same time as searching for a related subject, your website got here up. It appears to be good. I have bookmarked it in my google bookmarks to visit then. whilst people consider worries that they just don’t understand about. You controlled to hit the nail upon the top and also defined out the whole thing without having side effect , folks could take a signal. 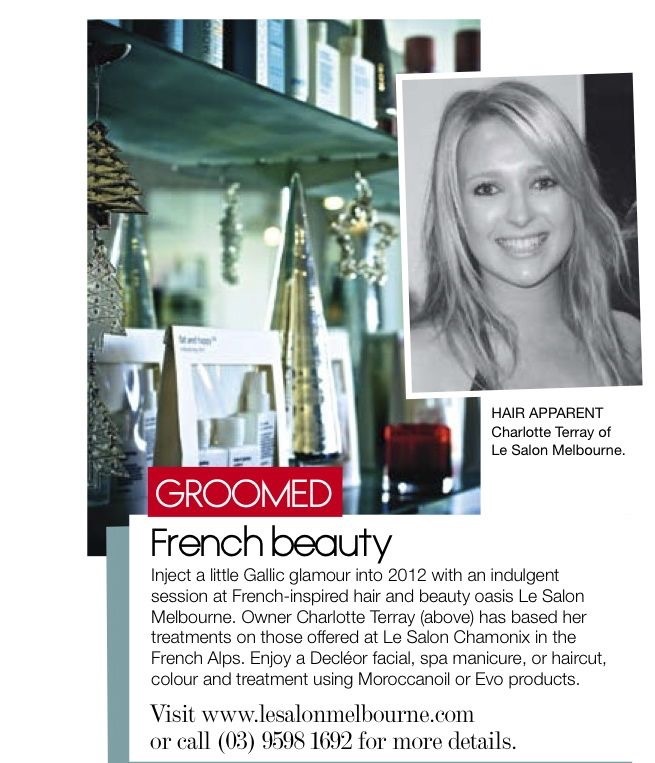 Over The Years – Le Salon is a little vanilla. You might add a video or a picture or two to get readers interested about what you’ve written. Just my opinion, it might make your blog a little livelier. Whats up very cool website!! Man .. Excellent .. Wonderful .. I will bookmark your site and take the feeds additionally…I’m satisfied to seek out numerous helpful info right here in the publish, we need work out more strategies on this regard, thank you for sharing. hey there and thank you for your info – I’ve certainly picked up anything new from right here. I did however expertise a few technical issues using this site, as I experienced to reload the web site lots of times previous to I could get it to load correctly. I had been wondering if your web hosting is OK? Not that I am complaining, but slow loading instances times will very frequently affect your placement in google and could damage your high quality score if ads and marketing with Adwords. Well I am adding this RSS to my email and can look out for a lot more of your respective exciting content. Ensure that you update this again very soon.. I do consider all the ideas you’ve offered to your post. They are really convincing and can definitely work. Still, the posts are very brief for beginners. May just you please lengthen them a little from next time? Thanks for the post. What i do not understood is in fact how you’re now not really much more neatly-preferred than you may be right now. You are so intelligent. You already know therefore significantly in the case of this matter, made me for my part imagine it from numerous various angles. Its like women and men are not interested until it¡¦s something to accomplish with Lady gaga! Your individual stuffs outstanding. All the time take care of it up! I have been browsing online more than 3 hours today, yet I by no means discovered any fascinating article like yours. It¡¦s pretty worth enough for me. Personally, if all site owners and bloggers made just right content as you probably did, the web will likely be a lot more useful than ever before. I in addition to my friends happened to be checking out the excellent information located on the blog and then the sudden I got a terrible suspicion I had not thanked the blog owner for those strategies. These young men were consequently passionate to see them and have in effect in actuality been taking pleasure in those things. Appreciation for indeed being very kind and for opting for this form of high-quality ideas millions of individuals are really eager to discover. My sincere apologies for not expressing appreciation to you sooner. Superb website you have here but I was curious about if you knew of any user discussion forums that cover the same topics talked about here? I’d really like to be a part of group where I can get advice from other experienced people that share the same interest. If you have any suggestions, please let me know. Thanks! I’ve been browsing online more than three hours these days, yet I never discovered any interesting article like yours. It’s pretty worth sufficient for me. In my view, if all web owners and bloggers made good content as you probably did, the net might be much more helpful than ever before. “When you are content to be simply yourself and don’t compare or compete, everybody will respect you.” by Lao Tzu. out till now. However, what about the conclusion? Are you certain concerning the supply? Hiya, I am really glad I’ve found this info. Nowadays bloggers publish only about gossip and internet stuff and this is really irritating. A good web site with exciting content, that’s what I need. Thanks for making this website, and I will be visiting again. Do you do newsletters by email? Hiya, I’m really glad I have found this information. Nowadays bloggers publish just about gossip and net stuff and this is really irritating. A good website with exciting content, this is what I need. Thank you for making this site, and I’ll be visiting again. Do you do newsletters by email? Helpful info. Lucky me I discovered your website accidentally, and I am shocked why this accident didn’t took place earlier! I bookmarked it. I have learn some excellent stuff here. Definitely price bookmarking for revisiting. I surprise how a lot attempt you place to make the sort of wonderful informative site. Hiya, I am really glad I have found this information. Today bloggers publish only about gossip and internet stuff and this is really irritating. A good website with exciting content, that is what I need. Thanks for making this website, and I’ll be visiting again. Do you do newsletters by email? Hiya, I am really glad I have found this info. Nowadays bloggers publish only about gossip and internet stuff and this is actually frustrating. A good web site with exciting content, that’s what I need. Thanks for making this website, and I’ll be visiting again. Do you do newsletters by email? excellent issues altogether, you just won a brand new reader. What may you recommend about your put up that you just made a few days ago? Any sure? Hiya, I am really glad I’ve found this info. Today bloggers publish only about gossip and net stuff and this is actually frustrating. A good blog with interesting content, this is what I need. Thanks for making this web-site, and I will be visiting again. Do you do newsletters by email? Hiya, I’m really glad I have found this information. Today bloggers publish just about gossip and internet stuff and this is actually annoying. A good site with interesting content, that is what I need. Thank you for making this web site, and I’ll be visiting again. Do you do newsletters by email? Hiya, I am really glad I have found this information. Nowadays bloggers publish only about gossip and internet stuff and this is really irritating. A good web site with interesting content, that’s what I need. Thank you for making this site, and I will be visiting again. Do you do newsletters by email? Hiya, I’m really glad I have found this information. Today bloggers publish just about gossip and internet stuff and this is actually irritating. A good site with interesting content, this is what I need. Thank you for making this web-site, and I will be visiting again. Do you do newsletters by email? Hiya, I’m really glad I have found this information. Today bloggers publish only about gossip and internet stuff and this is actually irritating. A good website with exciting content, that is what I need. Thank you for making this web site, and I’ll be visiting again. Do you do newsletters by email? Hello there. I found your web site by the use of Google even as looking for a similar matter, your web site came up. It appears to be great. I have bookmarked it in my google bookmarks to come back then. Greetings from Ohio! I’m bored to death at work so I decided to check out your website on my iphone during lunch break. I love the information you present here and can’t wait to take a look when I get home. I’m surprised at how fast your blog loaded on my mobile .. I’m not even using WIFI, just 3G .. Anyways, superb blog! First of all I want to say great blog! I had a quick question in which I’d like to ask if you don’t mind. I was curious to find out how you center yourself and clear your mind before writing. I have had trouble clearing my mind in getting my ideas out. I do take pleasure in writing however it just seems like the first 10 to 15 minutes are generally wasted just trying to figure out how to begin. Any recommendations or tips? Many thanks! Hi there. I found your website by way of Google even as looking for a related topic, your site came up. It seems great. I’ve bookmarked it in my google bookmarks to come back then. Hiya, I am really glad I have found this info. Nowadays bloggers publish just about gossip and internet stuff and this is actually annoying. A good site with interesting content, that is what I need. Thank you for making this site, and I will be visiting again. Do you do newsletters by email? Hey there. I found your site via Google whilst looking for a related matter, your website came up. It appears great. I have bookmarked it in my google bookmarks to visit then. Hey there. I discovered your website by means of Google whilst searching for a related subject, your web site came up. It appears to be great. I have bookmarked it in my google bookmarks to come back then. hi!,I really like your writing very a lot! percentage we keep in touch extra about your post on AOL? I need a specialist in this house to solve my problem. Maybe that is you! Having a look ahead to look you. Hiya, I’m really glad I have found this information. Today bloggers publish just about gossip and net stuff and this is really frustrating. A good website with exciting content, that is what I need. Thanks for making this site, and I will be visiting again. Do you do newsletters by email? I am now not sure the place you are getting your info, however great topic. I needs to spend a while finding out more or understanding more. Thanks for fantastic info I was on the lookout for this information for my mission. Hi there. I found your web site by way of Google while searching for a related topic, your web site came up. It appears to be good. I’ve bookmarked it in my google bookmarks to visit then. Hi there. I found your web site by means of Google at the same time as searching for a comparable matter, your site came up. It seems good. I have bookmarked it in my google bookmarks to visit then. Hiya, I am really glad I have found this information. Nowadays bloggers publish just about gossip and net stuff and this is really frustrating. A good website with exciting content, that’s what I need. Thanks for making this website, and I’ll be visiting again. Do you do newsletters by email? Hello there. I found your website by means of Google even as looking for a comparable matter, your site got here up. It seems great. I have bookmarked it in my google bookmarks to come back then. Hi there. I found your site by way of Google at the same time as searching for a similar matter, your site came up. It appears to be great. I’ve bookmarked it in my google bookmarks to visit then. Hey there. I discovered your website by way of Google even as searching for a related matter, your web site got here up. It looks good. I have bookmarked it in my google bookmarks to come back then. Hello there. I discovered your blog by the use of Google at the same time as looking for a related subject, your site got here up. It appears good. I’ve bookmarked it in my google bookmarks to come back then. Hey there. I discovered your blog via Google at the same time as looking for a related topic, your website got here up. It seems to be great. I have bookmarked it in my google bookmarks to come back then. I’m curious to find out what blog platform you happen to be utilizing? I’m experiencing some minor security problems with my latest blog and I’d like to find something more safe. Do you have any recommendations? Admiring the hard work you put into your blog and detailed information you present. It’s good to come across a blog every once in a while that isn’t the same outdated rehashed material. Excellent read! I’ve bookmarked your site and I’m adding your RSS feeds to my Google account. Hello there. I discovered your web site via Google even as searching for a related matter, your site got here up. It seems good. I’ve bookmarked it in my google bookmarks to come back then. Hiya, I’m really glad I’ve found this information. Today bloggers publish just about gossip and web stuff and this is actually frustrating. A good web site with exciting content, this is what I need. Thanks for making this web site, and I will be visiting again. Do you do newsletters by email? Hiya, I’m really glad I’ve found this info. Nowadays bloggers publish just about gossip and web stuff and this is really annoying. A good blog with exciting content, this is what I need. Thank you for making this web-site, and I’ll be visiting again. Do you do newsletters by email? Hi there. I discovered your website by way of Google at the same time as looking for a related matter, your site got here up. It appears to be good. I have bookmarked it in my google bookmarks to come back then. Hiya, I’m really glad I have found this info. Nowadays bloggers publish just about gossip and net stuff and this is really frustrating. A good site with interesting content, that is what I need. Thank you for making this website, and I’ll be visiting again. Do you do newsletters by email? Hi there. I found your web site by way of Google while looking for a similar subject, your site got here up. It appears to be good. I have bookmarked it in my google bookmarks to visit then. Hey there. I discovered your website by means of Google while searching for a similar subject, your web site got here up. It looks good. I have bookmarked it in my google bookmarks to come back then. Thanks for another informative website. The place else may just I am getting that type of information written in such a perfect approach? Hiya, I’m really glad I’ve found this info. Nowadays bloggers publish only about gossip and web stuff and this is really annoying. A good blog with exciting content, that’s what I need. Thanks for making this web-site, and I will be visiting again. Do you do newsletters by email? hi!,I really like your writing so so much! share we be in contact more approximately your article on AOL? I need a specialist on this house to unravel my problem. May be that’s you! Looking ahead to peer you. Hi there. I discovered your site by way of Google while searching for a related matter, your site got here up. It seems to be great. I’ve bookmarked it in my google bookmarks to come back then. Hiya, I’m really glad I’ve found this information. Nowadays bloggers publish just about gossip and net stuff and this is really irritating. A good web site with exciting content, this is what I need. Thank you for making this website, and I will be visiting again. Do you do newsletters by email? Hiya, I’m really glad I have found this information. Nowadays bloggers publish just about gossip and net stuff and this is actually irritating. A good web site with interesting content, that is what I need. Thank you for making this website, and I’ll be visiting again. Do you do newsletters by email? Hiya, I am really glad I’ve found this information. Today bloggers publish just about gossip and internet stuff and this is actually frustrating. A good blog with exciting content, that’s what I need. Thank you for making this web-site, and I will be visiting again. Do you do newsletters by email? Hey there. I discovered your site by way of Google at the same time as looking for a comparable subject, your site came up. It appears good. I’ve bookmarked it in my google bookmarks to come back then. Hello, its good paragraph regarding media print, we all know media is a impressive source of information. Hello there. I discovered your website via Google even as searching for a comparable subject, your website got here up. It looks great. I’ve bookmarked it in my google bookmarks to come back then. Hiya, I’m really glad I’ve found this info. Today bloggers publish only about gossip and internet stuff and this is really irritating. A good blog with exciting content, that’s what I need. Thanks for making this site, and I will be visiting again. Do you do newsletters by email? Hiya, I’m really glad I have found this info. Today bloggers publish just about gossip and internet stuff and this is really irritating. A good web site with exciting content, that is what I need. Thanks for making this web-site, and I will be visiting again. Do you do newsletters by email? Hiya, I am really glad I’ve found this info. Today bloggers publish just about gossip and net stuff and this is actually frustrating. A good website with interesting content, this is what I need. Thank you for making this web site, and I will be visiting again. Do you do newsletters by email? Hi there. I discovered your site by way of Google at the same time as looking for a related subject, your website came up. It appears to be great. I’ve bookmarked it in my google bookmarks to come back then. Hello there. I discovered your site by the use of Google even as looking for a similar matter, your site got here up. It looks good. I’ve bookmarked it in my google bookmarks to come back then. Hello there. I discovered your blog by way of Google at the same time as looking for a related subject, your site got here up. It appears to be good. I have bookmarked it in my google bookmarks to visit then. Hiya, I’m really glad I’ve found this info. Nowadays bloggers publish only about gossip and net stuff and this is actually irritating. A good blog with exciting content, that is what I need. Thanks for making this web-site, and I will be visiting again. Do you do newsletters by email? Hey there. I found your blog by the use of Google whilst searching for a similar matter, your site came up. It appears to be great. I’ve bookmarked it in my google bookmarks to visit then. Hi there. I found your web site by way of Google even as looking for a similar matter, your website got here up. It appears to be great. I have bookmarked it in my google bookmarks to visit then. Hey there. I discovered your site via Google even as looking for a related matter, your site came up. It seems to be great. I have bookmarked it in my google bookmarks to visit then. Hi there. I discovered your blog by means of Google at the same time as searching for a related subject, your site came up. It appears good. I have bookmarked it in my google bookmarks to visit then. Wonderful site. Plenty of helpful info here. I’m sending it to several pals ans additionally sharing in delicious. And naturally, thank you for your effort! Hi there. I found your site by the use of Google whilst searching for a comparable subject, your site came up. It appears great. I have bookmarked it in my google bookmarks to visit then. Hiya, I am really glad I’ve found this info. Nowadays bloggers publish only about gossip and net stuff and this is actually irritating. A good blog with exciting content, that’s what I need. Thanks for making this web site, and I will be visiting again. Do you do newsletters by email? Hiya, I am really glad I have found this info. Nowadays bloggers publish only about gossip and internet stuff and this is really annoying. A good site with interesting content, this is what I need. Thank you for making this website, and I will be visiting again. Do you do newsletters by email? Hiya, I am really glad I’ve found this information. Today bloggers publish just about gossip and internet stuff and this is really irritating. A good website with exciting content, that’s what I need. Thanks for making this web site, and I’ll be visiting again. Do you do newsletters by email? Hiya, I’m really glad I’ve found this info. Today bloggers publish only about gossip and net stuff and this is actually annoying. A good blog with interesting content, that’s what I need. Thank you for making this website, and I will be visiting again. Do you do newsletters by email? Hiya, I am really glad I’ve found this info. Today bloggers publish only about gossip and web stuff and this is really frustrating. A good blog with exciting content, that’s what I need. Thank you for making this web site, and I will be visiting again. Do you do newsletters by email? Hey there. I found your web site by way of Google whilst searching for a related subject, your website got here up. It appears great. I have bookmarked it in my google bookmarks to come back then. Hey there. I discovered your website by way of Google even as looking for a similar topic, your web site came up. It appears good. I have bookmarked it in my google bookmarks to visit then. Hiya, I am really glad I’ve found this information. Nowadays bloggers publish only about gossip and web stuff and this is really irritating. A good blog with exciting content, this is what I need. Thanks for making this site, and I will be visiting again. Do you do newsletters by email? Hey there. I found your site by way of Google even as looking for a comparable matter, your web site came up. It appears great. I’ve bookmarked it in my google bookmarks to visit then. I visited various web sites however the audio feature for audio songs current at this website is actually marvelous. Please let me know if you’re looking for a article author for your blog. You have some really great posts and I feel I would be a good asset. If you ever want to take some of the load off, I’d really like to write some material for your blog in exchange for a link back to mine. Please send me an e-mail if interested. Thank you! Hey there. I found your site by way of Google whilst searching for a similar matter, your site got here up. It appears to be great. I have bookmarked it in my google bookmarks to visit then. Hiya, I am really glad I have found this information. Today bloggers publish just about gossip and internet stuff and this is actually irritating. A good blog with exciting content, that is what I need. Thank you for making this website, and I will be visiting again. Do you do newsletters by email? Hey there. I discovered your website via Google at the same time as searching for a comparable matter, your web site got here up. It appears to be good. I’ve bookmarked it in my google bookmarks to visit then. Hiya, I am really glad I have found this info. Nowadays bloggers publish just about gossip and web stuff and this is actually frustrating. A good site with interesting content, that is what I need. Thank you for making this web site, and I’ll be visiting again. Do you do newsletters by email? Hiya, I am really glad I’ve found this info. Today bloggers publish only about gossip and net stuff and this is really annoying. A good web site with exciting content, that’s what I need. Thanks for making this site, and I’ll be visiting again. Do you do newsletters by email? Hey there. I found your web site via Google at the same time as looking for a related matter, your website came up. It appears great. I have bookmarked it in my google bookmarks to visit then. Hello there. I discovered your website via Google while searching for a comparable matter, your site got here up. It seems good. I’ve bookmarked it in my google bookmarks to visit then. Hiya, I am really glad I’ve found this information. Today bloggers publish only about gossip and net stuff and this is really annoying. A good web site with interesting content, that’s what I need. Thank you for making this web site, and I’ll be visiting again. Do you do newsletters by email? Hiya, I’m really glad I’ve found this information. Today bloggers publish only about gossip and net stuff and this is really irritating. A good blog with interesting content, that is what I need. Thank you for making this website, and I’ll be visiting again. Do you do newsletters by email? Hiya, I’m really glad I’ve found this info. Today bloggers publish only about gossip and net stuff and this is actually frustrating. A good web site with interesting content, that’s what I need. Thanks for making this web-site, and I’ll be visiting again. Do you do newsletters by email? Hiya, I’m really glad I’ve found this information. Nowadays bloggers publish just about gossip and web stuff and this is really irritating. A good website with exciting content, that’s what I need. Thank you for making this web site, and I will be visiting again. Do you do newsletters by email? Hi there. I discovered your web site by means of Google whilst looking for a related subject, your website came up. It seems great. I have bookmarked it in my google bookmarks to visit then. Hi there. I discovered your blog by the use of Google while looking for a comparable subject, your site came up. It appears good. I have bookmarked it in my google bookmarks to come back then. Hi there. I discovered your site via Google even as looking for a comparable subject, your website came up. It appears to be great. I have bookmarked it in my google bookmarks to come back then. Hello there. I found your website by means of Google at the same time as looking for a related subject, your web site got here up. It seems good. I’ve bookmarked it in my google bookmarks to come back then. Hello there. I found your site by the use of Google at the same time as looking for a related topic, your website got here up. It seems great. I’ve bookmarked it in my google bookmarks to come back then. Hiya, I’m really glad I’ve found this information. Nowadays bloggers publish only about gossip and web stuff and this is really irritating. A good blog with interesting content, this is what I need. Thanks for making this web-site, and I’ll be visiting again. Do you do newsletters by email? Hello there. I discovered your site via Google while searching for a comparable topic, your web site got here up. It appears great. I’ve bookmarked it in my google bookmarks to come back then. Hiya, I’m really glad I’ve found this info. Today bloggers publish only about gossip and internet stuff and this is really frustrating. A good website with interesting content, this is what I need. Thanks for making this web-site, and I will be visiting again. Do you do newsletters by email? Hiya, I am really glad I’ve found this information. Nowadays bloggers publish only about gossip and internet stuff and this is really frustrating. A good web site with interesting content, this is what I need. Thank you for making this website, and I’ll be visiting again. Do you do newsletters by email? Hey there. I discovered your web site by way of Google at the same time as searching for a comparable subject, your website came up. It looks great. I’ve bookmarked it in my google bookmarks to visit then. Hiya, I am really glad I’ve found this information. Today bloggers publish just about gossip and net stuff and this is really irritating. A good web site with exciting content, that is what I need. Thank you for making this website, and I will be visiting again. Do you do newsletters by email? Hello there. I discovered your website by the use of Google at the same time as looking for a similar topic, your website came up. It looks good. I have bookmarked it in my google bookmarks to come back then. Hello there. I found your website by way of Google even as looking for a comparable matter, your web site got here up. It appears great. I’ve bookmarked it in my google bookmarks to visit then. Hey there. I found your site via Google at the same time as searching for a related matter, your web site got here up. It seems to be good. I’ve bookmarked it in my google bookmarks to come back then. Hey there. I found your web site via Google while searching for a comparable subject, your website got here up. It seems great. I have bookmarked it in my google bookmarks to come back then. Hiya, I’m really glad I’ve found this information. Today bloggers publish only about gossips and web and this is actually frustrating. A good site with interesting content, that is what I need. Thank you for keeping this site, I will be visiting it. Do you do newsletters? Can not find it. Hey there. I found your blog by means of Google whilst searching for a related subject, your web site got here up. It appears to be great. I have bookmarked it in my google bookmarks to visit then. Hiya, I’m really glad I have found this info. Nowadays bloggers publish only about gossip and net stuff and this is really irritating. A good blog with exciting content, that is what I need. Thank you for making this web site, and I’ll be visiting again. Do you do newsletters by email? Hi there. I discovered your blog by the use of Google whilst searching for a comparable subject, your website came up. It looks good. I have bookmarked it in my google bookmarks to visit then. Hiya, I’m really glad I have found this information. Today bloggers publish just about gossip and internet stuff and this is actually annoying. A good web site with exciting content, that is what I need. Thank you for making this web-site, and I’ll be visiting again. Do you do newsletters by email? knowledge, so it’s pleasant to read this blog, and I used to pay a quick visit this website everyday. Hiya, I am really glad I have found this info. Nowadays bloggers publish just about gossip and internet stuff and this is really annoying. A good website with exciting content, that’s what I need. Thank you for making this web site, and I’ll be visiting again. Do you do newsletters by email? Hi there. I discovered your blog by the use of Google even as searching for a comparable matter, your website got here up. It appears to be good. I have bookmarked it in my google bookmarks to visit then. Hey there. I discovered your site by means of Google even as looking for a comparable topic, your site came up. It seems great. I have bookmarked it in my google bookmarks to visit then. Hi there. I found your website by means of Google even as searching for a comparable topic, your web site came up. It appears great. I’ve bookmarked it in my google bookmarks to visit then. Hi there. I found your web site by the use of Google even as looking for a related subject, your site came up. It appears great. I’ve bookmarked it in my google bookmarks to visit then. Hey there. I discovered your website by means of Google even as searching for a comparable topic, your web site came up. It looks great. I’ve bookmarked it in my google bookmarks to come back then. Hey there. I found your web site by way of Google at the same time as searching for a comparable topic, your site got here up. It appears to be great. I have bookmarked it in my google bookmarks to come back then. Hello there. I found your blog by the use of Google even as looking for a comparable matter, your site got here up. It seems to be good. I have bookmarked it in my google bookmarks to come back then. Hiya, I’m really glad I’ve found this information. Today bloggers publish just about gossip and web stuff and this is really frustrating. A good website with exciting content, this is what I need. Thank you for making this web-site, and I will be visiting again. Do you do newsletters by email? Hello there. I found your website by way of Google even as looking for a similar subject, your web site came up. It looks great. I have bookmarked it in my google bookmarks to come back then. Hey there. I discovered your site via Google while looking for a comparable matter, your site got here up. It appears great. I’ve bookmarked it in my google bookmarks to visit then. Hello there. I found your site by means of Google while looking for a similar matter, your web site got here up. It seems good. I’ve bookmarked it in my google bookmarks to visit then. Superb post however I was wondering if you could write a litte more on this subject? I’d be very grateful if you could elaborate a little bit further. Thank you! Hiya, I am really glad I have found this information. Today bloggers publish just about gossip and web stuff and this is actually frustrating. A good web site with exciting content, this is what I need. Thanks for making this web site, and I will be visiting again. Do you do newsletters by email? Hello there. I found your web site via Google even as looking for a related matter, your site got here up. It appears to be great. I’ve bookmarked it in my google bookmarks to come back then. Hiya, I’m really glad I’ve found this info. Today bloggers publish just about gossip and web stuff and this is actually annoying. A good site with interesting content, this is what I need. Thank you for making this site, and I’ll be visiting again. Do you do newsletters by email? Hiya, I am really glad I’ve found this information. Nowadays bloggers publish only about gossip and net stuff and this is actually annoying. A good website with exciting content, this is what I need. Thanks for making this website, and I’ll be visiting again. Do you do newsletters by email? Hey there. I found your site by means of Google at the same time as searching for a related topic, your site came up. It seems good. I have bookmarked it in my google bookmarks to come back then. Hiya, I am really glad I have found this info. Today bloggers publish only about gossip and web stuff and this is actually irritating. A good blog with interesting content, this is what I need. Thanks for making this site, and I’ll be visiting again. Do you do newsletters by email? Hello there. I found your blog via Google whilst looking for a related subject, your web site got here up. It seems good. I’ve bookmarked it in my google bookmarks to visit then. Hiya, I am really glad I’ve found this information. Today bloggers publish just about gossip and internet stuff and this is really frustrating. A good site with interesting content, this is what I need. Thank you for making this website, and I’ll be visiting again. Do you do newsletters by email? Hiya, I’m really glad I have found this info. Today bloggers publish only about gossip and net stuff and this is really frustrating. A good site with exciting content, this is what I need. Thanks for making this web-site, and I’ll be visiting again. Do you do newsletters by email? Hi there. I found your website via Google whilst searching for a related matter, your web site got here up. It appears great. I have bookmarked it in my google bookmarks to come back then. Hiya, I am really glad I have found this info. Nowadays bloggers publish only about gossip and web stuff and this is really irritating. A good site with exciting content, this is what I need. Thanks for making this web site, and I’ll be visiting again. Do you do newsletters by email? Hi there. I found your website by way of Google at the same time as searching for a comparable topic, your web site came up. It appears great. I have bookmarked it in my google bookmarks to come back then. Hiya, I am really glad I’ve found this information. Nowadays bloggers publish just about gossip and web stuff and this is actually irritating. A good blog with exciting content, this is what I need. Thank you for making this web site, and I’ll be visiting again. Do you do newsletters by email? Hey there. I discovered your site by way of Google whilst searching for a related topic, your website came up. It looks great. I have bookmarked it in my google bookmarks to come back then. Hey there. I found your blog by means of Google while looking for a comparable topic, your site got here up. It seems great. I’ve bookmarked it in my google bookmarks to visit then. Hiya, I’m really glad I’ve found this info. Today bloggers publish just about gossip and net stuff and this is really frustrating. A good web site with exciting content, that’s what I need. Thank you for making this website, and I’ll be visiting again. Do you do newsletters by email? Hiya, I am really glad I’ve found this info. Nowadays bloggers publish just about gossip and internet stuff and this is actually irritating. A good blog with interesting content, that is what I need. Thanks for making this website, and I’ll be visiting again. Do you do newsletters by email? Hi there. I discovered your web site by way of Google whilst searching for a comparable subject, your website came up. It seems to be good. I’ve bookmarked it in my google bookmarks to visit then. you are a real very good webmaster. The web page loading speed is incredible. Apparently you are doing any kind of one of a kind trick. Besides, The articles are masterpiece. you have done a fantastic job in this particular topic! You completed a number of fine points there. I did a search on the matter and found mainly people will have the same opinion with your blog. Valuable info. Fortunate me I found your site by chance, and I’m shocked why this coincidence didn’t came about in advance! I bookmarked it. Hiya, I’m really glad I have found this information. Today bloggers publish just about gossip and internet stuff and this is really annoying. A good blog with interesting content, that is what I need. Thank you for making this web-site, and I’ll be visiting again. Do you do newsletters by email? Hiya, I am really glad I have found this info. Nowadays bloggers publish only about gossip and internet stuff and this is really frustrating. A good website with interesting content, that’s what I need. Thanks for making this site, and I’ll be visiting again. Do you do newsletters by email? Hiya, I am really glad I’ve found this information. Today bloggers publish only about gossip and web stuff and this is actually annoying. A good blog with interesting content, that’s what I need. Thank you for making this web-site, and I will be visiting again. Do you do newsletters by email? Hiya, I’m really glad I have found this info. Today bloggers publish just about gossip and net stuff and this is actually irritating. A good blog with exciting content, that’s what I need. Thank you for making this website, and I’ll be visiting again. Do you do newsletters by email? Hiya, I’m really glad I’ve found this information. Today bloggers publish only about gossip and net stuff and this is really annoying. A good blog with exciting content, that is what I need. Thanks for making this website, and I’ll be visiting again. Do you do newsletters by email? Hey there. I discovered your website by the use of Google even as looking for a comparable topic, your website got here up. It looks good. I’ve bookmarked it in my google bookmarks to visit then. Hello there. I found your blog via Google at the same time as searching for a similar subject, your web site got here up. It seems good. I have bookmarked it in my google bookmarks to visit then. Hiya, I’m really glad I’ve found this info. Nowadays bloggers publish only about gossip and internet stuff and this is really irritating. A good web site with exciting content, that’s what I need. Thank you for making this website, and I will be visiting again. Do you do newsletters by email? Hey there. I found your blog by way of Google while looking for a related matter, your website came up. It appears to be great. I’ve bookmarked it in my google bookmarks to visit then. Hi there. I discovered your web site by way of Google whilst searching for a comparable subject, your web site got here up. It seems great. I’ve bookmarked it in my google bookmarks to visit then. Hello there. I discovered your website by means of Google whilst looking for a comparable topic, your site got here up. It looks good. I have bookmarked it in my google bookmarks to visit then. Hi there. I found your website via Google while looking for a comparable matter, your site got here up. It seems to be good. I have bookmarked it in my google bookmarks to visit then. Hiya, I am really glad I’ve found this info. Nowadays bloggers publish just about gossip and net stuff and this is actually irritating. A good site with interesting content, that’s what I need. Thank you for making this web-site, and I’ll be visiting again. Do you do newsletters by email? Hiya, I am really glad I have found this information. Today bloggers publish just about gossip and web stuff and this is really annoying. A good site with interesting content, that’s what I need. Thanks for making this site, and I’ll be visiting again. Do you do newsletters by email? Hiya, I am really glad I’ve found this info. Nowadays bloggers publish just about gossip and net stuff and this is really frustrating. A good site with interesting content, this is what I need. Thank you for making this site, and I will be visiting again. Do you do newsletters by email? Hello there. I discovered your blog by the use of Google at the same time as looking for a similar topic, your web site got here up. It appears good. I’ve bookmarked it in my google bookmarks to come back then. Hello there. I discovered your web site via Google while looking for a comparable topic, your site got here up. It appears to be great. I’ve bookmarked it in my google bookmarks to come back then. Hello there. I found your web site via Google at the same time as looking for a comparable topic, your web site came up. It looks great. I have bookmarked it in my google bookmarks to come back then. Hiya, I’m really glad I have found this information. Nowadays bloggers publish just about gossip and internet stuff and this is really irritating. A good site with exciting content, this is what I need. Thank you for making this web site, and I’ll be visiting again. Do you do newsletters by email? Hiya, I’m really glad I’ve found this information. Today bloggers publish only about gossip and web stuff and this is actually irritating. A good web site with exciting content, this is what I need. Thanks for making this web-site, and I’ll be visiting again. Do you do newsletters by email? Hi there. I discovered your blog via Google whilst looking for a comparable subject, your website got here up. It seems great. I have bookmarked it in my google bookmarks to visit then. Hey there. I discovered your site via Google whilst looking for a related matter, your site came up. It appears great. I have bookmarked it in my google bookmarks to visit then. I do believe all of the concepts you have introduced for your post. They’re very convincing and will definitely work. Nonetheless, the posts are too short for newbies. Could you please prolong them a bit from subsequent time? Thank you for the post. Hiya, I’m really glad I’ve found this info. Today bloggers publish only about gossip and internet stuff and this is actually annoying. A good website with interesting content, that’s what I need. Thanks for making this web-site, and I’ll be visiting again. Do you do newsletters by email? Hi there. I found your web site by means of Google while searching for a comparable topic, your site got here up. It looks good. I have bookmarked it in my google bookmarks to visit then. Hi there. I discovered your web site by the use of Google while searching for a comparable matter, your web site came up. It looks great. I’ve bookmarked it in my google bookmarks to come back then. Hi there. I discovered your web site by way of Google even as searching for a related subject, your web site got here up. It appears great. I have bookmarked it in my google bookmarks to visit then. Hiya, I am really glad I’ve found this info. Nowadays bloggers publish only about gossip and net stuff and this is actually annoying. A good web site with exciting content, this is what I need. Thanks for making this web site, and I will be visiting again. Do you do newsletters by email?